There can be something unintentionally hilarious about a retrospective show. The museum or gallery bestows its aura upon an artist whose body of work is brought together with hushed thematic reverence. But then, when we see it all together the volume and repetition poke us in the ribs and remind us that it isn't very good at all. Actually, it's a bit ridiculous. Well this is what's happening at Sydney's MCA with the international touring show 'Annie Leibovitz: A Photographer's Life'. Across the space of the museum's third floor we're reminded that there's nothing as funny as that pompous middlebrow middle-ground where art, celebrity and advertising meet in a smug vacuum. There isn't that much of Leibovitz's big set piece baroque fantasies here. The tone is serious, at least in a kind of 'look at me I'm being serious' way. There is some of the lush art direction that has sucked in the stylistic traits of the perfume and couture advertisers that these pictures appear alongside but that's mainly confined to a single room. Instead there's a more or less chronological run through 15 years of sombre yet portentous portraiture, family snapshots and massive overblown landscapes. The chronological hang is a very mixed blessing. It gives a narrative strand to the photographer's family photos but it also means that early on you walk into a room and are struck by how massively derivative so much of the work is. So when she's with dancers on a beach you see Herb Ritts, big landscapes are photocopies of Ansel Adams, photos of US Olympians could have been taken by Leni Riefenstahl and art and grit intrudes with impersonations of Nan Goldin. There is a candy-like feel to a lot of this work. 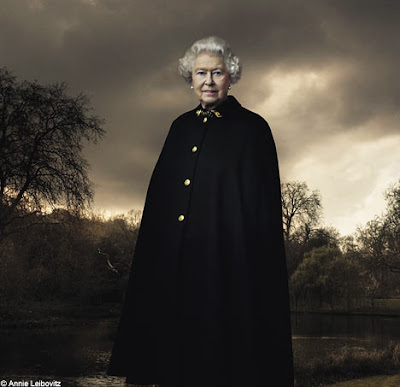 There is undeniable pleasure as Queen Elizabeth look like she's more 'Lord of The Rings' than 'Monarch of the Glen', The White Stripes get all the kooky bohemian signifiers as the circus and 'A Clockwork Orange' intersect and Cindy Crawford is a gorgeously fleshy Cranach. But you can't help thinking that it's not very good for you, that all those layers of visual sugar don't actually add any depth. The more you look the shallower it gets and the more you realise each hint of insight and intelligence is a stylistic trope a signpost for 'clever', 'smart' or 'deep' that never takes you to the place itself. There's an awful lot of cant talked about how Leibovitz captures her some essential humanity in her work better than some other portrait photographers. It's a claim I find curious. Repeatedly you see in these images the trademarks of a flattened depth of field and an almost hyper-real colour saturation, it's a striking signature and an effect that breaks many portrait conventions. However it also has a distancing effect the image is an Annie Leibovitz style portrait ,with all its ticks and tricks rather than some window onto the soul. Where there is a depth it's in the layers of irony, intended and otherwise, that attend each of the celebrity portraits. The notion that celebrities (whether models, artists, actors or politicians) are somehow closed books who the photographer opens with an insightful lens is pretty flawed. For some years the trajectory of celebrity image making has shot toward a place where flaws are as much a currency as glamour was in pre-war Hollywood. The majority these set-piece shots aren't stars stripped of their varnish with some naked candour, they're just as contrived as the airbrushed perfection of Hollywood gone by, but this time they're in the modern celebrity idiom of therapy culture, where a flaw or two gives a gives perspective to our true fabulousness. 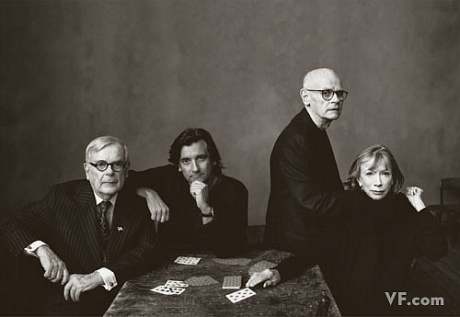 Just like Hollywood stars hamming it in arthouse vanity cameos Leibovitz appropriates some of the signifiers of 'Art' here. It feels like an attempt to claim the spurious gravitas necessary to justify museum wallspace (assuming that celebrity pulling power on its own isn't enough). This the enlargements of these prints are messy at the edges, suggesting the sweat and toil of the atelier. 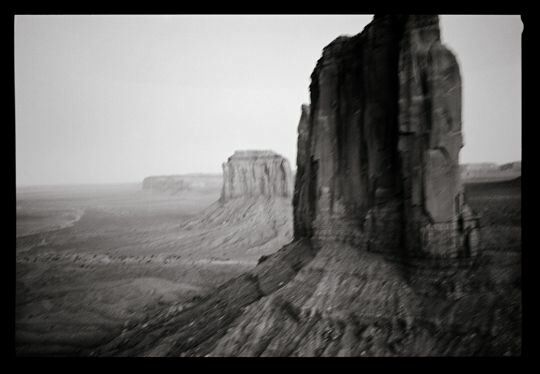 Most strikingly the landscapes are massive wall sized slabs of black and white. Massive art need to be questioned for its motives. Scale has a pummeling effect on the viewer, it thunders self-importance and for that very reason it demands greater scrutiny. In this case the size of the images shouts louder than the content, the essential message is "I must be important art, because YOU can't print anything this big!" Death and personal suffering have a tendency to neutralize objective criticism. The chronological seam of the show is sown with the thread of Leibovitz's relationship with her lover Susan Sontag, finishing in her decline and death. Biographically I have no doubt that it's interesting but artistically it feels like little more than a scrapbook. Formally most are presented as black and white snaps, some are quite beautiful, others quite mundane. Either way one cannot help wonder whether they would be of any intrinsic interest if they didn't have Sontag as their subject. The final image, and the one that sticks, is of Sontag's dead body laid out. It is composed of printed a number of frames that have been patched together, at once there's a touch of polyptych, death mask and tomb sculpture. The Sontag photographs highlight a wider problem here. Plenty of minor artists have documented the the lives of titans, but they remain footnotes in the histories. Leibovitz works in and around the public culture of celebrity and on the edge of another culture of America's public intellectuals, I'm sure it makes for a great dinner party but it doesn't make her an artist of any significance. What you get instead is a kind of middlebrow paparazzi effect where a profusion of 'serious' (let's assume that taking oneself very seriously like the profusion of method actors here suffices to deserve that description) contemporary cultural figures lend some kind of minor cachet and allow viewers to tick a list of the recognisable great and good. It's dangerous to equate artistic merit to subject matter, that's a criteria for photojournalism, but the single most striking image of the show is one of shocking reportage. 'Traces of the massacre of Tutsi schoolchildren and villagers on a bathroom wall, Shangi Mission School Rwanda' is as brutally sad as it is simple. 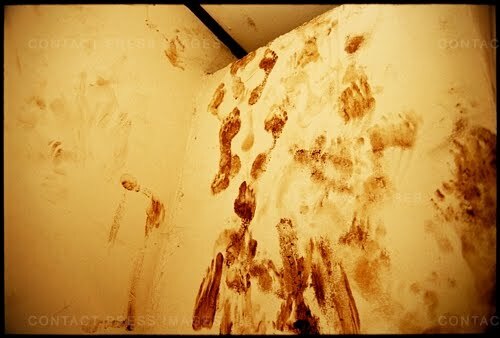 The smears of bloodies hand prints, red caking into brown, hint at something almost unimaginable. The flatness and colour saturation work here. The yellow walls have a crime scene starkness and the lack of context is disorienting. The crop of the picture leaves you wondering is you see a wall or a floor or what the sheer amount of blood must mean, the lack of compass is a perfect visceral response to horror. Perhaps it's the celebrity thing. The fact that I just don't care how well she's caught people acting out a public image. But there's also a feeling that Leibovitz is a celebrity photographer who photographs celebrities and if she wasn't this work wouldn't be be here. Other people's oddly cropped holiday snaps wouldn't merit hanging on a gallery wall nor would a series of derivative student-like experiments in art photohgraphy. Which makes me question which value system the gallery has bought into by staging the exhibition (although the fifteen dollar entrance fee pretty much answers that question for me). It's shame something so glossy and dumb should take up so much space and time in one of Sydney's few large scale art fora. You can call me snob but I really need something more than a middlebrow 'Where's Wally?' from the MCA.